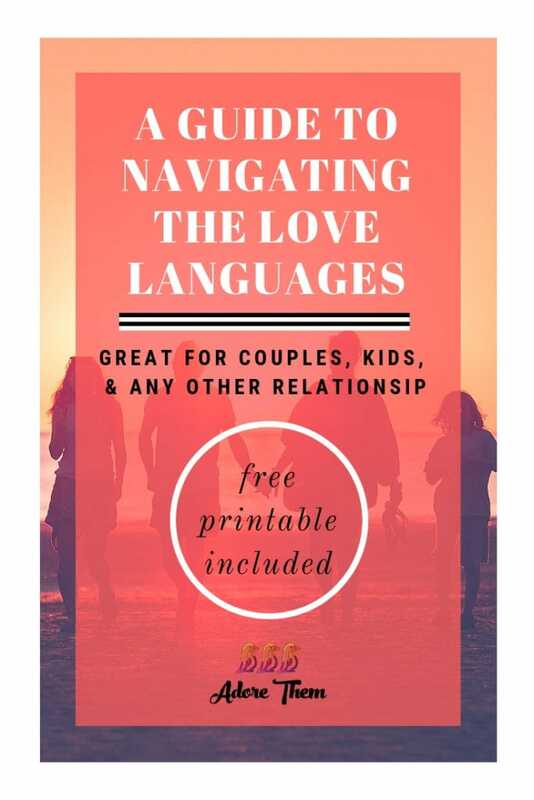 If you have not read the book “The 5 Love Languages”, I would highly recommend it! But let me summarize for you my favorite points. 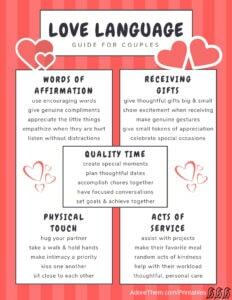 Basically there are 5 love languages that include Words of Affirmation, Receiving Gifts, Quality Time, Physical Touch, and Acts of Service. Every person is stronger in one of these areas, and this is how they truly feel love and appreciated. The challenge is that we tend to show someone else that we care through the way that we feel loved; but this might not make as big of impact for that individual if it is not their love language. Even if you don’t read the book, you can take the quiz to find out what area is most important to you and your partner. Then you can use this resource when trying to show them that you do indeed love and appreciate all that they do. 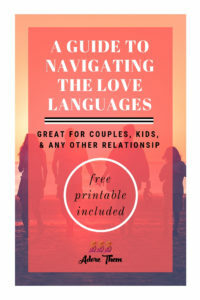 While there are several of these books that dive deeper into this concept for couples, kids, teenagers, and there are several other wonderful additions; the basic concept is so valuable and can be applied to any type of relationship or friendship. Words of Affirmation – If this is your love language, then compliments, verbal encouragement, and acknowledgement all mean a lot to you! This also means that the opposite is the most painful, such as verbal abuse and non-constructive criticism. If you have a spouse, child or friend like this, then you need to be extra cautious about what is coming out of your mouth. To you it might be an innocent remark, or a quick reaction that you later regret; but for these individuals it can be devastating. So try to make a positive remark whenever possible. Compliment them on their efforts, their accomplishments, and acknowledge what they are saying to you. Receiving Gifts – The misconception with this one is that you just want expensive gifts. While I doubt anyone will say “No” to designer handbags or sparkling jewelry, this is not the point. What it does mean is that everything you receive is sentimental, and special occasions are very important. No matter how big, how small, how expensive, or even if it is handmade, to this individual it is special. The thought of someone thinking about you and your interests, and then sharing/gifting it with/to you, truly means more than words! Often times these individuals love little trinkets from fun outings or their travels, they appreciate their child’s crafts, and save just about anything & everything. But this also means that they put a lot of time into gifting things to you. Even if gifts are not your love language, it is theirs – so show your appreciation when receiving, make that extra effort when giving them something in return, and don’t forget to really celebrate those special occasions! Quality Time – I think it is safe to say that we all love spending quality time with someone we care about! But for certain people, this is even more important! Intimate date nights, or special outings together are wonderful! But this can even mean simply taking a walk together, running errands with one another, accomplishing something as a team, sitting down and having uninterrupted conversation with zero distractions – these are the moments that really count! Long phases without this one-on-one time will be the biggest challenge you should try to avoid. Extended periods of time apart, or the lack of quality time together, will leave these individuals feeling unimportant and will ultimately hurt the relationship. Physical Touch – Obviously couples should try to share intimate moments, but this can also be explored beyond the bedroom. Your kids might appreciate a nice big bear-hug before they head off to school, or expect those bed-time kisses and snuggles each night. They often like holding your hand, sitting on your lap, and being as close to you as possible. If this is not your love language, then it may at times feel like an invasion of your personal space. But if you can understand the true importance behind it, make sure that you are not just telling them that you care – SHOW them that they are very much loved! The other side of this should also be considered when disciplining. Spanking and physical withdrawal will have a major negative impact on these individuals, so look for other ways to help them learn and grow. Acts of Service – We all like when someone does a chore for us, or serves us breakfast in bed! But for certain people, this means so much more! Even if you are not able to take over their entire workload, helping them with certain tasks, caring for them in a thoughtful way, and surprising them with random acts of kindness, will make a big impact! Consider making their favorite meal, take out the trash before they wake up, leave a sweet note in their car with a hot cup of coffee; these small acts of service will go a long way! But what will be hurtful to these individuals in no follow through. Don’t say you will paint their bedroom and then never get around to it. Be careful not to say yes to the teacher, your boss, to your church, and to everyone else around you; but then drop the ball on those at home. Remember that taking care of these individuals is what shows them you really do care! 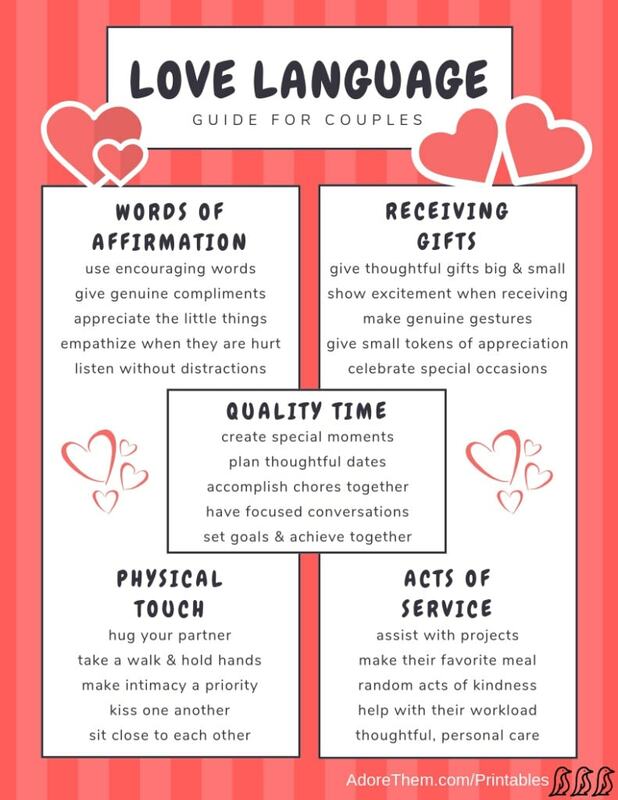 While you might have read this list and thought “All of these love languages are important to me” you might be right. We all feel loved in a variety of ways. But, if you take the quiz or read one of the books, you will most likely realize that there are one or two areas that are more important to you. And if someone in your life is failing to show you their love through your language, than that relationship might be suffering. Maybe your partner only ever gives you nice things, but fails to ever give you a compliment. Chances are that their love language is Receiving Gifts, and that is how they are showing they care. But it might also mean that you are not feeling acknowledged or appreciated. Or maybe you have a friend that you have been running errands for and going out of your way to help, but it still feels like they are pulling away from the relationship – were you showing them love through Acts Of Service when instead their real desire was simply Quality Time? Did you ever hear of marriages, relationships, or even work partnerships that eventually fell apart and their reasoning was “we simply grew apart”? While sometimes that may be true for a variety of reasons, I often am left wondering, did they simply not feel appreciated? There was no big fight or drama that made headline news. No scandalous affair or physical abuse. But the lack of love, or the lack of feeling loved, is very hard to live with. And this is the reason I encourage you to figure out how those around you feel loved, and figure out a way to show them that you really do care by considering their love language.